Our US Military rings can be used to mark special occasions in a soldier’s life. Typically, they are designed to display the rank, insignia or name. A solders many achievements can be recorded on this small piece of jewelry. They not only create a legacy for generations to come but also symbolize a soldier’s military life. For instance, veteran rings evoke memories when the retired soldiers were active in the force, while deployment rings are designed to commemorate and record the involvement of the soldiers in various wars. Not every army man wears a military ring but if they are going to wear any ring then custom military rings are the preferred option. For any solder to wear a military ring he must have achieved something in the army. Normally, they are meant for recognition. Some US Military Rings are worn based on the number of years that the soldiers have served in the army or the rank they have reached. This is why there are military rings for veteran soldiers, generals, and those who have fought certain wars. These rings can be custom made in a traditional style or be personalized with the details that are relevant to the solder whom they are made for. This allows them to show the details of service. While making custom military rings, the first step is to make a list of all the units, divisions, details and dates served over the years. Also, the combat zones, the campaigns, and the deployments that a soldier fought are listed. After this, important details such as the names, dates, and designs are extracted from the list. These are then engraved above the emblem that is selected for the sides. Most military rings are available in gold, silver, zinc and copper. Generally, gold military rings are similar to the traditional high school rings which can either be oval or square and enhanced by a gemstone to reflect the month. Although some people wear these rings every day, others wear gold military rings on special occasions as a proof of the sacrifice they have made for the country. The costs of these rings often vary depending on the materials they have been created from. 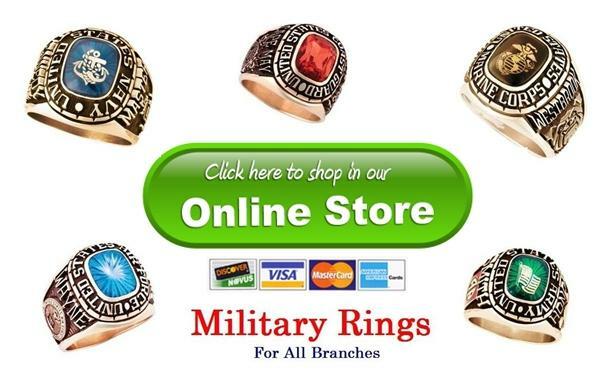 Silver military rings can be bought for as little as $199 while gold military rings can go for even $899. The ring’s price can also differ depending on the whether it has been given a natural or an antique finish.